The AMD World Championships for 2104 have come and gone for another year, and as always there’s quite a mixed bag of new bikes to peruse. But what’s good to see is that some of the more traditional Harley builders are embracing new-school influences to move the game one a little. Less billet, more brilliance so to speak. One of those builders is middle Deutschland’s One Way Machine. 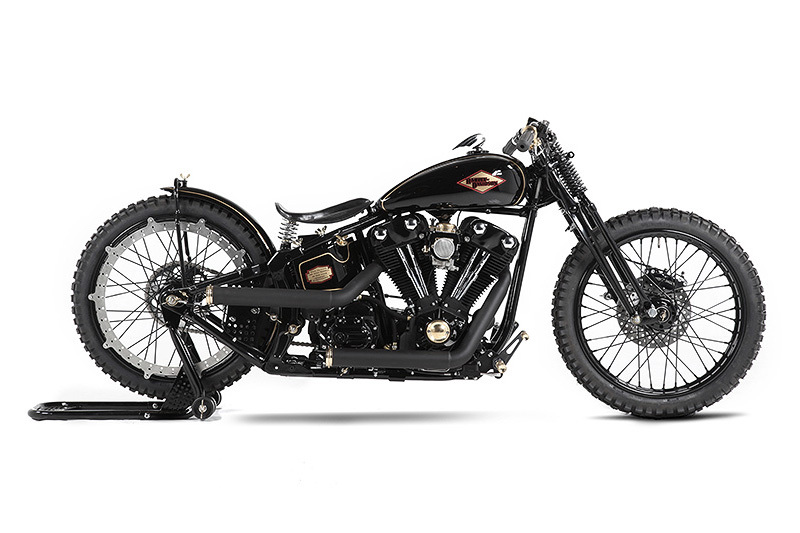 Starting with a decidedly old-school, mid-ninties HD Softail, they’ve managed to build a boardtracker-inspired custom that is about as close to the original hog as Frankfurters are to sushi. Here’s their ‘La Salle’ Fat Boy bobber. This beast recently came third in the AMD World Championships. It’s the latest creation by Belgium bike builder Fred Krugger. It’s named the ‘Overmile’ and is a tribute to his favourite bike, the XR750. You can definitely see the resemblence. Love how he has cut away the tank to accomodate the rocker boxes. If like us you want to see more check out Kruggers website for some build pics. Also hit this video to see the machine in action.